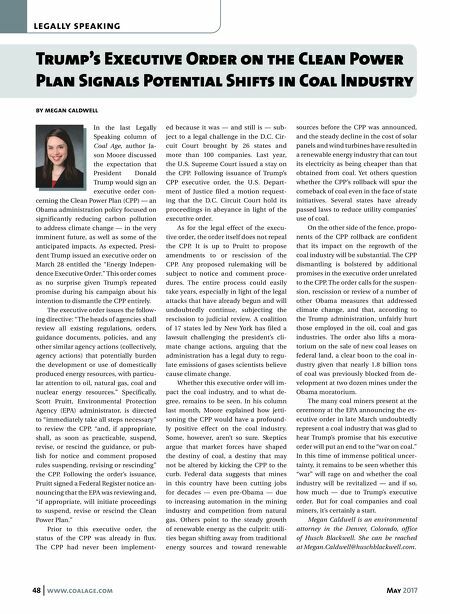 48 www.coalage.com May 2017 legally speaking Trump's Executive Order on the Clean Power Plan Signals Potential Shifts in Coal Industry by megan caldwell In the last Legally Speaking column of Coal Age, author Ja- son Moore discussed the expectation that President Donald Trump would sign an executive order con- cerning the Clean Power Plan (CPP) — an Obama administration policy focused on significantly reducing carbon pollution to address climate change — in the very imminent future, as well as some of the anticipated impacts. As expected, Presi- dent Trump issued an executive order on March 28 entitled the "Energy Indepen- dence Executive Order." This order comes as no surprise given Trump's repeated promise during his campaign about his intention to dismantle the CPP entirely. The executive order issues the follow- ing directive: "The heads of agencies shall review all existing regulations, orders, guidance documents, policies, and any other similar agency actions (collectively, agency actions) that potentially burden the development or use of domestically produced energy resources, with particu- lar attention to oil, natural gas, coal and nuclear energy resources." Specifically, Scott Pruitt, Environmental Protection Agency (EPA) administrator, is directed to "immediately take all steps necessary" to review the CPP, "and, if appropriate, shall, as soon as practicable, suspend, revise, or rescind the guidance, or pub- lish for notice and comment proposed rules suspending, revising or rescinding" the CPP. Following the order's issuance, Pruitt signed a Federal Register notice an- nouncing that the EPA was reviewing and, "if appropriate, will initiate proceedings to suspend, revise or rescind the Clean Power Plan." Prior to this executive order, the status of the CPP was already in flux. The CPP had never been implement- ed because it was — and still is — sub- ject to a legal challenge in the D.C. Cir- cuit Court brought by 26 states and more than 100 companies. Last year, the U.S. Supreme Court issued a stay on the CPP. Following issuance of Trump's CPP executive order, the U.S. Depart- ment of Justice filed a motion request- ing that the D.C. Circuit Court hold its proceedings in abeyance in light of the executive order. As for the legal effect of the execu- tive order, the order itself does not repeal the CPP. It is up to Pruitt to propose amendments to or rescission of the CPP. Any proposed rulemaking will be subject to notice and comment proce- dures. The entire process could easily take years, especially in light of the legal attacks that have already begun and will undoubtedly continue, subjecting the rescission to judicial review. A coalition of 17 states led by New York has filed a lawsuit challenging the president's cli- mate change actions, arguing that the administration has a legal duty to regu- late emissions of gases scientists believe cause climate change. Whether this executive order will im- pact the coal industry, and to what de- gree, remains to be seen. In his column last month, Moore explained how jetti- soning the CPP would have a profound- ly positive effect on the coal industry. Some, however, aren't so sure. Skeptics argue that market forces have shaped the destiny of coal, a destiny that may not be altered by kicking the CPP to the curb. Federal data suggests that mines in this country have been cutting jobs for decades — even pre-Obama — due to increasing automation in the mining industry and competition from natural gas. Others point to the steady growth of renewable energy as the culprit: utili- ties began shifting away from traditional energy sources and toward renewable sources before the CPP was announced, and the steady decline in the cost of solar panels and wind turbines have resulted in a renewable energy industry that can tout its electricity as being cheaper than that obtained from coal. Yet others question whether the CPP's rollback will spur the comeback of coal even in the face of state initiatives. Several states have already passed laws to reduce utility companies' use of coal. On the other side of the fence, propo- nents of the CPP rollback are confident that its impact on the regrowth of the coal industry will be substantial. The CPP dismantling is bolstered by additional promises in the executive order unrelated to the CPP. The order calls for the suspen- sion, rescission or review of a number of other Obama measures that addressed climate change, and that, according to the Trump administration, unfairly hurt those employed in the oil, coal and gas industries. The order also lifts a mora- torium on the sale of new coal leases on federal land, a clear boon to the coal in- dustry given that nearly 1.8 billion tons of coal was previously blocked from de- velopment at two dozen mines under the Obama moratorium. The many coal miners present at the ceremony at the EPA announcing the ex- ecutive order in late March undoubtedly represent a coal industry that was glad to hear Trump's promise that his executive order will put an end to the "war on coal." In this time of immense political uncer- tainty, it remains to be seen whether this "war" will rage on and whether the coal industry will be revitalized — and if so, how much — due to Trump's executive order. But for coal companies and coal miners, it's certainly a start. Megan Caldwell is an environmental attorney in the Denver, Colorado, office of Husch Blackwell. 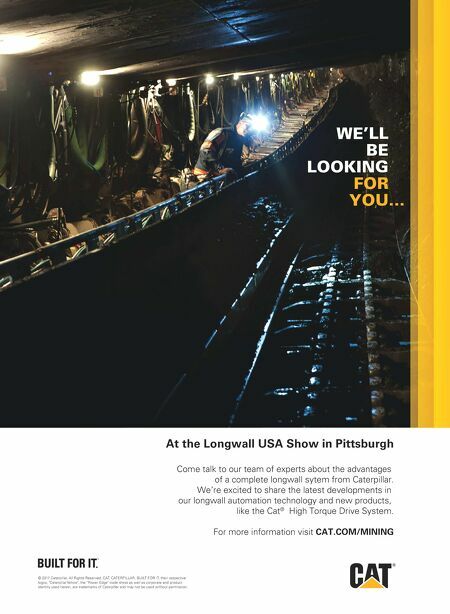 She can be reached at Megan.Caldwell@huschblackwell.com.